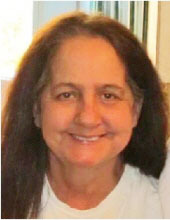 Rita Fay Adkins Fraley, 64, of Garrison, passed away Saturday morning, September 15, 2018, at her home. She was born September 7, 1954, in Lewis County, a daughter of the late Edward Adkins and Wilma Jane Lawson McCane. Rita was of the Christian faith and a homemaker. She enjoyed quilting, going to bingo, playing games, gardening and spending time with her family and friends. Rita is survived by her husband of 46 years, William David Fraley; two sons, William Fraley and Edward Fraley both of Portsmouth, Ohio; two daughters, Chasity Fraley (Larry Lykins) of Garrison and Misty Walters (Dan Yates) of Sciotoville, Ohio; seven grandchildren; one great grandchild; two brothers, Terry Johnson (Rhonda White) of St. Paul and Roger Duane McCane (Melissa Scott) of Vanceburg; five sisters, Janet Kay Fraley (Winfred) of Garrison, Joyce Bentley (Danny), Kathy Adkins and Vonda Clark (Bud) all of Vanceburg and Jeanie Cullum (Jerry) of West Portsmouth, Ohio; and several nieces and nephews. She also leaves many other family members and friends who will sadly miss her. In addition to her parents, she was preceded in death by five brothers, Randy Adkins, Donnie Adkins, Ronnie Adkins, John Adkins and Eric McCane. Services will be at 11:00 a.m. Wednesday, September 19, 2018, at Globe Family Funeral Chapel in Garrison with Bro. Chris Lawhun officiating. Burial will follow in Bethel Cemetery. Friends may visit from 9:30 a.m. until 11:00 a.m. Wednesday, September 19, 2018, at Globe Family Funeral Chapel, 103 Dudley Avenue at Garrison.